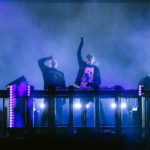 About a month ago, the faceless producer Malaa released “Bylina,” which has since become an anthem for the mysterious artist. The recognizable lyrics which are chanted throughout the piece (“It’s all about house music”) have resonated firmly with listeners since the release of this eerie, yet energetic track. Backed by Tchami’s Confession imprint, the official package for the track includes four remixes by Lenny Kiser, Dateless, Noise Frenzy, and Shapeless. These revisions take the original production one step further through the divergent creative interpretations of each artist. Spanning a variety of styles, the package illuminates the artistry of each producer by featuring them all in a distinct light.